One of the automotive marketing trends for 2018 is “user experience.” Car shoppers are now more informed and savvy than ever before. With that experience, knowledge, and know-how comes a new set of needs. To sell to car buyers today, the user experience should be considered—it’s what will catch users’ attention and keep it there. Car dealership websites are no different. More car buyers will visit your website before making the trek to your dealership, which means your website is your front-line sales rep. By making the user experience on your website great, you can help ensure more online users will head over to your lot. Here is why auto dealer digital marketing requires a unique user experience. We get closer and closer to the day that all purchases—even vehicles—will happen online. The internet pervades every other facet of our lives and purchasing isn’t immune. This means that your website can be considered a sales rep on your team, and you want it providing the very best in service that you offer. Take the time to consider a journey through your website. How do visitors arrive and from where? What are they looking for when they get there? After finding it, what will they want next? Consider the journey and make it as efficient as possible. Auto dealer digital marketing targets digitally savvy visitors. That means they come to expect certain qualities, such as great website design, a robust search function, the ability to filter search options, and speedy search results. 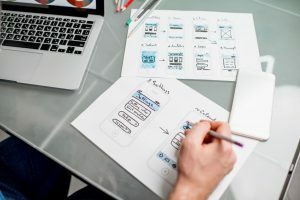 A user experience with these qualities will help you keep customers on your website—and ensure they come back time and time again. One of the simplest ways to provide a unique user experience is by tailoring your auto dealer digital marketing to the individual. With apps like Facebook and Twitter, this is easier than you may think. You can create ads that target specific demographics or geographical areas. It’s subtle, but by using the wealth of data that is constantly being collected in the digital realm, you can tailor your approaches to the user and make for an engaging user experience, which often translates into a satisfied purchase. Digital may provide incredible access, but people will always want a little time to think. After they’ve done their research, they’ll step away from your site. With lead nurturing tools, you don’t have to lose this potential client. You’ve grabbed their attention with a unique user experience and can continue that experience in their inbox with gentle, periodic follow-ups that bring them back for the purchase. People want and respond to a unique user experience, and when your auto dealer digital marketing embraces that strategy, your ROI will be better than ever.